Having access to community health centers can make a real difference for some people, but the level of care they receive can be affected by the resources available. That was the case at the Clarkston Community Health Center, where members of the Emory Ophthalmology Interest Group (OIG) offer quarterly vision screenings to uninsured people from the Metro Atlanta area. Optometrist Fulya Anderson, OD, is one of the attending doctors who helps supervise the Clarkston Center screenings. "The purpose of the screening is to get a basic assessment of overall eye health and determine the need or urgency of a referral, but this can be difficult," she says. "Without the proper equipment, the simplest aspects of the eye cannot be examined." When screenings at the Clarkston Center first began, physicians and students had only direct ophthalmoscopes to use during exams. Anderson knew that adding a slit lamp to the exam room would benefit both patients and medical students. "A slit lamp helps us look more thoroughly at all aspects of the eyes, assess an accurate eye pressure, and even look at the retina with a lens," she explains. "I also thought of how much more beneficial having a slit lamp would be for the medical students. 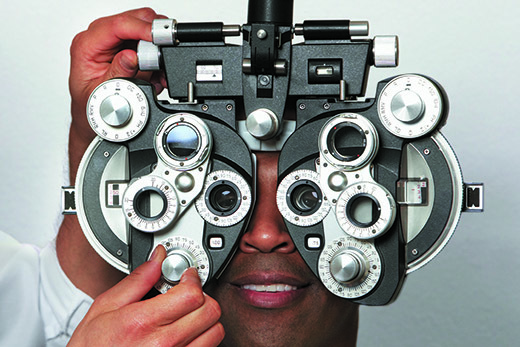 They're interested in ophthalmology, so what better way to learn than to have the proper equipment to assess the eyes?" After talking with one of the Emory Eye Center's administrators, Anderson learned that the Emory Midtown Clinic might be getting new slit lamps. She then approached Mallard Benton, Emory Eye Center's senior business manager, for more details. Benton soon identified several pieces of unused equipment that the Eye Center could donate to the Clarkston Center: a Marco Deluxe Stand, Marco Custom Chair, CSO slit lamp, and Woodlyn phoropter. He met with health center representatives to determine the best way to handle the additions, then mapped out a plan and arranged for a Lombart Instruments representative to deliver and set up the equipment. Within only a few weeks, the new exam room was up and running. "This has made such a difference in the level of care we're able to provide patients as well as the education we're able to offer the students," Anderson says. "Having a slit lamp at the Clarkston Center allows us as medical students to practice looking at and learning about all the different segments of the eye in the same way that practicing physicians do," says Cliff Guyton, an Emory medical student and president of the OIG. "Plus, it's really fun to see the tools that are actually used in an ophthalmology clinic." Whatever equipment is available, the physicians and students realize what an opportunity they have with the patients. "I love being able to provide a service by screening people who don't have good access to health care," Guyton says. "Being able to get hands-on clinical experience as a medical student is also very valuable to our education. I'm extremely grateful to everyone who helped Clarkston acquire the slit lamp. It's a great screening and teaching tool."